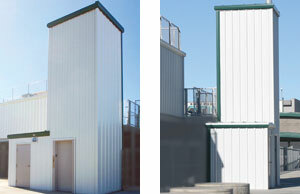 [XPB-ASB-PB-E] ADA Press Box Elevators have a capacity of 35,000 lbs. They are fully equipped standard elevators that meet ADA requirements. These elevators are fully assembled modular hoistay tower with an oil hydraulic machine. The installation only takes one day and it’s a lesson- site construction with a lower maintenance design. For shipping quotes, orders or questions please call our Customer Service Center at 1-877-483-9270.